GREAT DOOR COUNTY WINTER GET-A-WAY! WE ARE NOW TAKING REQUEST FOR 2017. PUT YOUR REQUEST IN NOW TO GET ON THE LIST! Short Drive to SAND BEACH! The Trails End Cottage was newly constructed in 2015. Located just off the waters of Clark Lake. (not directly on the water) It is just a short drive (or bike ride) to the boat launch and the Clark Lake Public Beach. Enjoy the very spacious second story living area consisting of three nicely sized bedrooms, large living room area with flat screened TV and newer, comfortable furniture, a nice full amenity kitchen, dining area off the kitchen and a large elevated deck complete with gas grill, table and chairs. The Deck is the perfect place to enjoy your morning coffee and evening cocktails. You will find this property to be extremely clean, well maintained, private, cozy and comfortable. Whitefish Bay Dunes State Park & Clark Lake County Park are just minutes away. Take a ride into to Jacksonport (just minutes away) and catch lunch at Mike's Port Pub, one of Door County's most popular destinations for locals and visitors alike. Excellent food, cold beer, excellent cocktails and welcoming atmosphere. Local hamlets including Egg Harbor, Fish Creek, Baileys Harbor and Ephriam are just short drive away. The Trail End Cottage is perfect for couples, families, fishermen or Girls Get-A-Way! We hope to hear from you soon. Full Bathroom off living room close to Second & Third bedrooms. Master bedroom has a full private bathroom. Nice back yard with fire pit. Nice covered deck overlooking the street below and woods. Perfect place for early morning coffee and evening cocktails. Plenty of room for your kayak or canoe. Public launch just minutes from your door. Not provided but plenty of room to store your bikes in the garage. Plenty of room to park your boat. Public boat launch just minutes from your door. Choose from several courses within a 20 minutes drive. Property was very clean and well kept. It's a short drive to wherever you need to go in Door County. We would love to stay here again. This house is a good place for a group to hang out. Lovely, lovely second-story deck that does have adequate protection for small children, it's like an outdoor room. We didn't have any small children with us but noticed there is a child safety gate that could be put up at the top of the long straight stairway. You really need to get into a car and drive somewhere to get to a beach--we were hoping otherwise, but that's how it was. But of course it wasn't far. 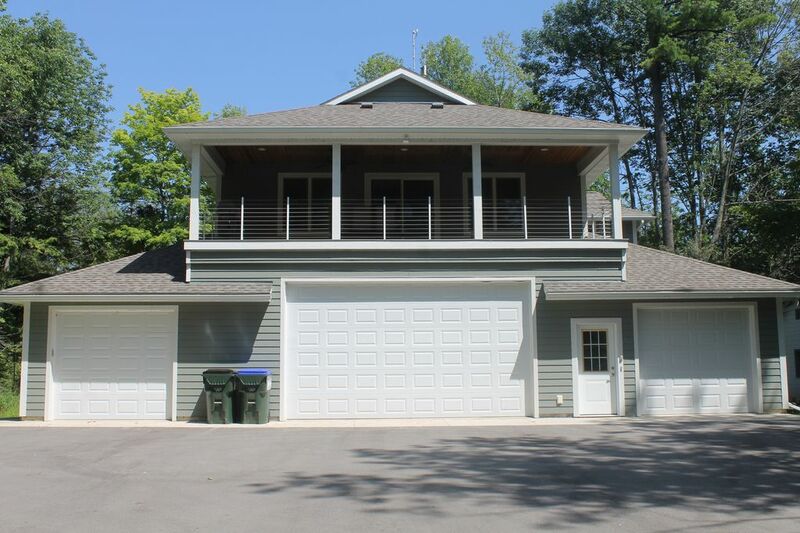 This house is a great place for people who just want to hang out at the beach, Cave Point and Whitefish Dunes to be specific. Also not far from Jacksonport town beach, which we fell in love with. A responsive manager for any issues, a memorable vacation for us! This house was very nice. It had almost everything we needed and was in a quiet, secluded area. Everything worked at the house (appliances, grill, etc). The TV took awhile to figure out how to use the controls. We enjoyed visiting many places in Door County: Washington Island, Peninsula State Park (biking, kayaking, SUP, beach), Whitefish Dunes State Park(hike & beach; nearby), Shipwreck/Lighthouse tour out of Bailey's Harbor, Ridges Range lights, fish boil & shopping in Fish Creek and Egg Harbor, Door Shakespeare and Lautenbach Orchard store--lots of tastings there! Fish Creek would have been a bit more central for our activities, but this location was OK.
Nice location. Clean. Modern. Comfortable. We spent there the Memorial Day week end - 4 adults, 2 kids and a baby. The property is very clean, premium furniture and appliances. Very quiet area, with wildlife around (from the property we saw deer, rabbits...). We really enjoyed the ideal location in the center of Door County. Every major go to places are within 20 minutes drive. Thanks Ben!! Hope to have you back in the future! This is a very nice house with a great deck! Comfortable bedrooms and good common space. Some basics were overlooked (such as toilet paper and pot holders), which is why I’m giving 4 stars and not 5, but that is easily rectified! Very friendly host.